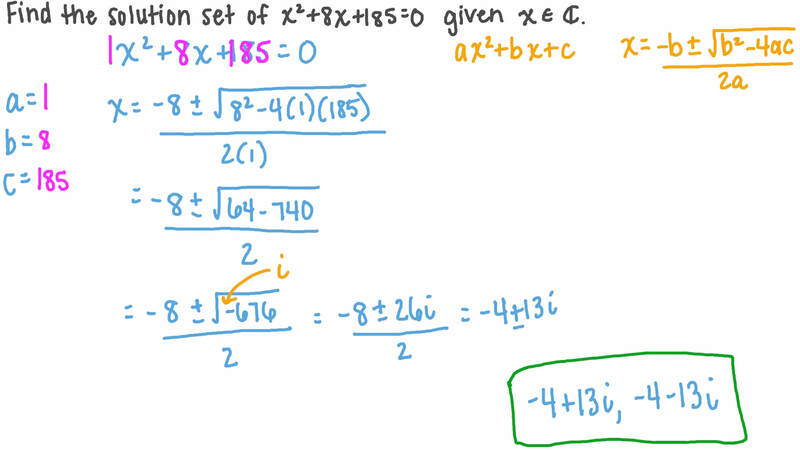 In this lesson, we will learn how to solve quadratic equations whose roots are complex numbers. Determine the solution set of 𝑥 − 8 𝑥 + 1 8 5 = 0 2 over the set of complex numbers. Which of the following best describes the roots of the equation 𝑥 + 1 7 = 0 2 ? Factor 𝑥 + 𝑦 2 2 over the complex numbers. Solve the equation 5 𝑥 + 1 = − 3 1 9 2 . Given that ( 8 − 6 𝑖 ) is one of the roots of 𝑥 + 𝑏 𝑥 + 6 = 0 2 , determine the value of 𝑏 . 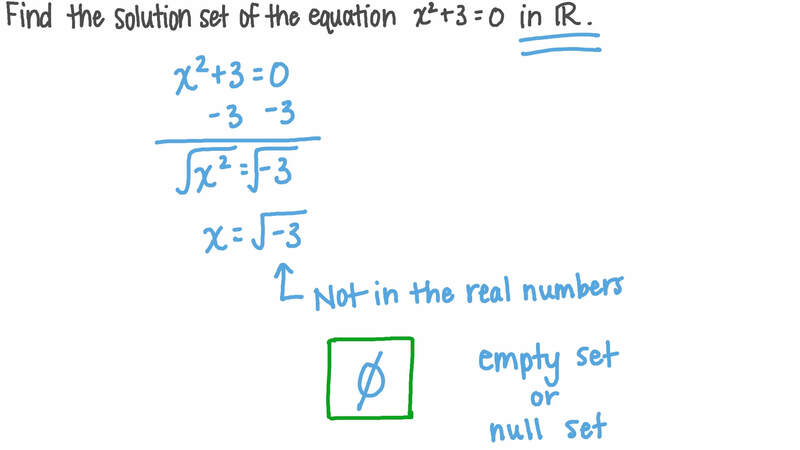 Find the roots of the quadratic equation ( 𝑥 + 4 ) + 8 = 0 2 . Solve the equation 2 𝑥 + 8 = 0 2 over the set of complex numbers. Find the solution set of 𝑥 + 5 = 0 2 . Find the solution set of 𝑥 + 8 𝑥 + 1 8 5 = 0 2 given 𝑥 ∈ ℂ . Find the solution set of − 6 𝑥 + 5 𝑥 − 5 = 0 2 over ℂ . 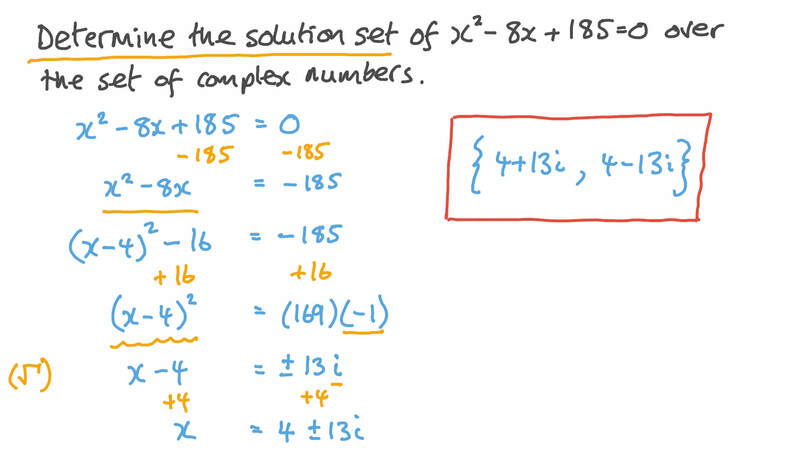 Find the solution set of − 𝑥 + 1 6 = 0 4 in the set of complex numbers. Find the solution set of the equation 𝑥 + 3 = 0 2 in ℝ . If the discriminant of a quadratic equation with real coefficients is negative, will its roots be a complex conjugate pair? Which of the following best describes the roots of the equation 𝑥 − 1 7 = 0 2 ? Factor 𝑥 + 9 2 over the complex numbers. Solve the equation 𝑥 = − 1 2 . Which quadratic equation has roots 𝑥 = ± 3 𝑖 ?